It may be the last UK landfall before the Arctic but don’t be fooled by clichés about the climate or ponies. 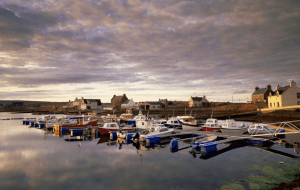 The Northern Isles are a thriving hub of culture, wildlife and stunning natural beauty. Greeted by a bracing winter chill and the smell of fresh wood shavings, we push the door aside and step into the boatshed on Hay’s Dock. Little seems to have changed inside for over a century with two 100 year-old hulls lying in state beside each other. Both are being restored by two retired octogenarians, expert boat craftsmen in their day our guide Cathy explains while pointing to where the old slats meet pristine new wood. It would be hard to find a more fitting metaphor for the islands. Robust in preserving its heritage while ushering in a bright future, the Shetland Isles occupy a unique place within Scotland with their strong Viking, seafaring and musical traditions. Showcasing them recently as part of the Year of the Islands, the islanders have worked hard to promote their distinctive assets and dispel clichés that seem to have stuck fast; that Shetland has little to offer except ponies and glacial gales. Despite warnings from friends, we pack up the car and sail north to discover just what it is that makes Shetlanders so proud of their island domain. And it is pride. Leading us back through to the new adjoining Shetland Museum, our guide oddly stops us in our tracks to look at the floor tiles glistening with green and brown speckles. “Can you guess what they are?” “Glass?” I reply after some hesitation. The expression on her face is unmistakably delight and rightly so. Given the remote location of the islands (over 100 in total), everything from glass bottles to boats is given a second life. On the 15 inhabited islands, boat keels become garage and shed roofs or even chicken coups. Living 110 miles north of the northernmost tip of Scotland, Shetlanders have populated and been self-sufficient on the islands for 6,000 years and it’s quite an achievement. Heritage is a strong element of tourism here and most visitors are enticed to come in January for the world famous Up Helly Aa Festival in Lerwick (pictured below), to experience the traditional Viking boat burning spectacle and celebrations. 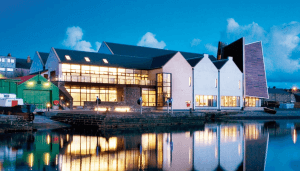 In May, the Shetland Folk Festival gets into full swing with world class live sessions from local and international musicians and in August, Shetland’s own annual film festival Screenplay takes hold on the island. With more resident seabirds than people, the islands are a dream for naturists and photographers. Wildlife here is bountiful and, during the summer months, over a million seabirds return to Shetland to breed. Colonies of gannets, terns, guillemots and puffins live in abundance in the crags of towering cliff faces on out-lying islands like Papa Stour, Foula, Fetlar and Unst and in the surrounding seas, it’s often possible to spot killer whales, dolphins and porpoises. Shetland Nature (www.shetlandnature.net) offers the opportunity to get up close to both wildlife and the sea-sculpted landscapes with day tours to Fetlar and Unst running all year round. Our base is Cunningsburgh, a coastal village just south of the capital Lerwick and within easy reach of some of the island’s most staggering beauty spots, like the crystalline waters at St Ninian’s Isle; a much loved spot but more often than not you’ll have it entirely to yourself as you take a stroll along the causeway or picnic on its unspoilt beach. We stay at Abun-da-Voe (pictured below), a comfortable four star self-catering apartment furnished with every creature comfort (including complimentary Wi-Fi in case you feel too isolated from civilisation). Perched on a hill overlooking Cunningsburgh Voe, each new season brings a fresh view over the sea loch.